since i not unwillingly embarked on my 10,000 calorie weekend, i have achieved little in the way of keeping myself fit, and the only thing i’m losing is the battle against putting on too much weight. not long ago, as a law student, i saw myself balloon from less than 130 lbs to more than 170 lbs in over a year. today that i am presumably less sedentary, i am well on my way to becoming as disgustingly obese as i was before i graduated. my weekly 2.5km runs at the gym , coupled with other aerobic endeavors, such as badminton and mountaineering cannot quite cope with my burgeoning appetite for all things fattening. while beer may be a huge factor, my actuations these past days have contributed to my increasing weight. last week, i finally got to sample the “orange restaurant” -- circles at the shangri-la makati courtesy of joseph. the dinner buffet is easily the best i have had, and i don’t recall having a more sumptuous eat-all-you-can in the past. the buffets at the marco polo and the westin certainly pale in comparison, and i regret not having a camera with me to photograph the cacophony of color that was available. i honestly would have been satisfied with the appetizers alone. being a huge fan of japanese food, i overstuffed on sushis, sashimis and makis, and all these other uncooked treats. there was also a generous helping of oysters, mussels, and prawns. my next foray was in the salad section. halfway into my plate of greens, i knew my tank was full. but joseph began talking about slices of lamb and mint jelly and several other ideas that caused my mouth to water. it didn’t help that the aroma of authentic curry wafted as i passed the asian section, so i had to make room for more, although there clearly was no vacancy. being quite the restaurateur that he is, joseph made great suggestions about food choices. suggestions which, i would later regret, drove me farther away from the goal of going back to having a 31 inch waistline. i capped the night with sugarfree ice cream and a truckload of dessert. sugarfree didn’t necessarily mean fat free, and there was nothing guiltless about the whole thing. before the evening was over, i was certain i had gained over 5 pounds easy. certainly, overstuffing on food glorious food shouldn’t make me feel too guilty since i can always lose a few calories in the gym (and that exactly is the problem: i only get to lose a few). but i somehow feel that i am going back to my old self, when running a course at the academic oval becomes such a chore. so although i ran 2.5kms immediately the following day, i feel that i am no nearer the ideal, since i gain more than i lose. i have absolutely nothing against fat people, although i must say it does not quite suit me. so when i saw an old buddy from my raya days sporting a 180lb frame, i had to double take. 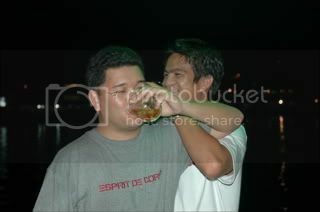 gene pascual certainly looked better when we were both freshmen. i asked him a series of questions like, “are you married?” and “how’d you get so big?” marriage, he hinted, had nothing to do with it. but an injury did. now although he looks like a sloppy tub of lard on the treadmill when he alternately runs and walks, at least he has a slip disk factor to blame for the added pounds. i had law school to point at in the past. who do i blame now for my lateral growth? a better paying job? i don’t think so. and it isn’t helping that AMCI has done little in helping me keep fit. presumably my soirees in the mountains would assist me in burning fat, but it is the parties in between that inflate me. it is those after-badminton dinners at rufo’s. those pre- and post-climb meetings at drinking places. those wednesday schedules at digi café. it is those things that conspire to make me less of the person that i want to be, physically. and i don’t blame AMCI really, but me, for having absolutely no control. 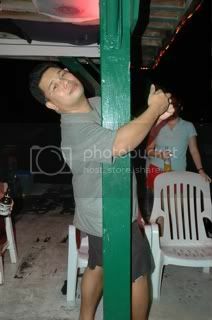 and this lack of control continued when i left for puerto galera to celebrate the birthdays of tito boy and roy. when i left the house at around noon (i couldn’t get myself to wake up for the 8am rendezvous since i went out with lowell -- who’s also gained too much weight, living the good life in canada for several months -- and ava the previous night) decked in shorts and slippers, my mom doubted i was going to an overnight birthday party. of course i skipped details like it was going to be in mindoro, possibly on a floating bar, and that it will involve a lot of beer and other bitter-tasting drinks. i met up with xenon in makati and we reached batangas in time for a 5pm banca to sabang. when we were near the shore, one of the boatmen said that the nice ship anchored at the mouth of sabang was the M/V sarangani, and i remember reading in TB’s blog that he would be diving in galera. so i placed a phone call to him and told him i could see the ship. later that evening, he picked us up and introduced us to underwater photographer gutsy tuason and grizzly, a dog owned by his girlfriend amanda griffith. now it is only my second time to be in sabang, and i don’t recall ever seeing that high a concentration of caucasians and their spawns in so small a place. 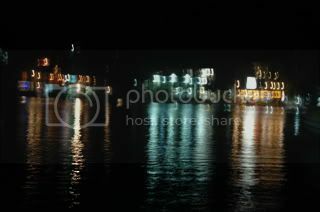 sabang is a filthy, sleazy, crowded, and sinful place, blaring with loud music, and blinking with dizzying neon lights. there is hardly any beach and the water near the shore is murky. it is, however, a haven for divers and pleasure-seekers, pleasure being a most subjective term. it is also one of kuya mar’s most favorite places, and where tito boy is celebrating his birthday with a few of his friends. after meeting up with the rest of the crew, we caught up with the dwindling evening by finding our accommodations (after a miscue which could’ve potentially sent us to jail for attempted trespass to dwelling), and shouting at the floating bar to send the flatboat to pick us up. tin and i had to buy ribs (we got lost again) and were ferried to the bar which, to my surprise, played music, and was tended to by two pubescent girls. roy somehow was able to convince them to stay open till after 8pm. we left close to 10pm, and we had several rounds of beer, a few shots of johnny walker black -- a brew which is possibly one of the more expensive face-wrencher known to man -- and a lot of dancing. we had so much fun at the floating bar, it was a wonder no one fell to the water, drunk and drugged with the weekend’s rush. we left the floating bar after 9pm, famished and well on our way to being extremely inebriated. so we had dinner at mcrom’s where we were given 5-minute massages while we waited for our food. after dinner, we visited the M/V sarangani where cutebalddiver was spending his luxury weekend, and my only regret was not being able to get amanda’s picture and autograph. 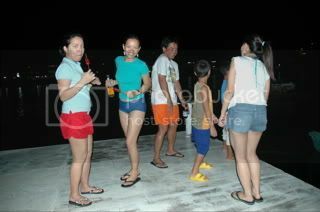 after visiting the yacht, we went back to shore and looked for videoke. very predictably alotaya. i sang "this is the moment" and "change the world" before i fell asleep on a bench somewhere. from there, we moved around and peeked at some of the girly bars. i saw unattractive, fat, ungraceful women attempting something, specifically what i was uncertain. it may have been a dance of seduction. or an impersonation of a sick bird, awkwardly walking along sabang’s dank back alleys. sabang is gomorrah, and white beach is sodom. one is best advised to flee without looking back. we ended up in it’s okay videoke to drink more beer and sing more songs. 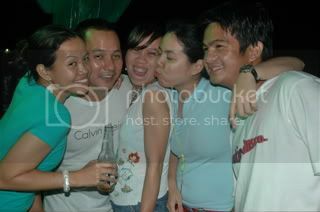 by this time, our brains were swimming in beer and alcohol, and we were either very sleepy or bereft of inhibitions. i was surprisingly lucid, and i remember distinctly roy saying “okay ka talaga alman” and “i can make 1 million in a month”. 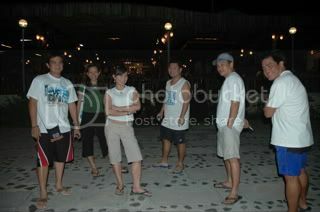 when the videoke closed shop, we walked back to our lodging place. it was far. or maybe it felt far. once there, i just blew air into my therm-a-rest and plopped down. i woke up the following day with my neck hurting. a while later, kuya mar went into the room and i joined him for breakfast at el galleon. we were served by a funny waitress named alma who had quite a personality. from there, we walked to the big la laguna beach, passing a resort which kuya mar refers to as the white house. the red sun is built on a wall of adobe, and has a most unique design and architecture. a promise was floating in the air that we’d be staying there. at la laguna, we had massages on the beach. my body was smothered with coconut oil by this foul-mouthed masseuse. i feigned sleep and had to keep from laughing out loud. at one point, they spoke about men’s underwear. then, we had lunch at a nearby resto. from there, we had to run back to our resort to prepare for our trip back home. we booked rides in white beach so we didn’t have to rush. but just our luck, the resort ran out of water, and marga forgot her mask and snorkel, so we were delayed a little. 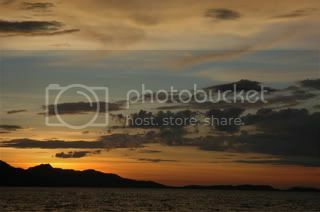 the road connecting sabang and white beach is narrow and winding, and at some points, has some wonderful vistas. 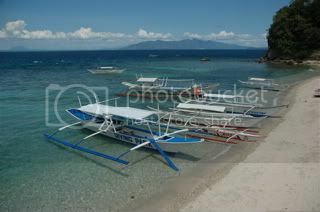 upon reaching white beach, there were conflicting reports that no trips were scheduled for 5pm. for a second i entertained the thought of staying in galera an extra night. a scalper got us tickets, and while waiting, it crossed our minds that we had just been robbed, when at 5pm, our banca was nowhere in sight. it arrived a bit late, but before long, we were slicing the body of water between mindoro and batangas peacefully, while the sun was setting, casting its pale, yellow light on mt. lobo and verde island. we reached batangas after 6pm, and were quickly on our way to tagaytay for dinner at leslie’s. we dissected the bauan-balayan-lemery-tagaytay road (incidentally, this is where malvin got lost after our batch climb last december). at leslie’s, we had bulalo and whatever else was on our minds as we lifted our glasses to toast to tito boy’s added wisdom. i took home two large bones for our dogs, and had mixed emotions about what took place the past two days: i certainly enjoyed the company of adventurous, low-maintenance friends, regardless of the pearl seller jokes and in-fairness-you-have-really-nice-eyes comments (well, i’m self-deprecating anyway), but felt bad about having to eat too much. i’d like to cut down on something, like meat, or merienda. but certainly not on the amazing company. 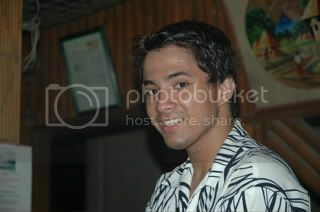 miguel, masseur slash server at mcrom’s. good looks, squeaky vaginal voice. you can’t have them all. xenon has his number. f*** didnt know you took my pics! got to bauan, batangas at 8pm. we had dinner on board the sarangani on the way back to batangas. hehehhe... luxury is an understatement. buti na lang i put it behind the LJ cut. haha. o sige. mang-inggit ka pa. hindi ko na nga na-meet si amanda. harumph! hayaan mo. i promise to let you meet her and get her autograph one of these days. pag hindi ka pumunta sa party ko, no autograph!